Mr Thompson said the changes would make the BBC "more creative"
The BBC is reorganising to make it easier for audiences to have access to hit shows in any way they want. Director general Mark Thompson has given new media an expanded role in the corporation, with responsibility for making programmes available on demand. The way the BBC makes programmes will be streamlined, with a show's output across TV, radio, internet and mobiles all considered at the same stage. The changes are part of BBC plans to ensure it survives in the digital age. Under the plans, the people who commission and produce shows like EastEnders and Little Britain will be joined for the first time in a new department called BBC Vision. It will also incorporate the current Drama, Children's and Entertainment (DEC), Television, and Factual and Learning divisions. The department will be headed by the current director of television, Jana Bennett. Mr Thompson said the aim was to make it easier, and faster, to turn innovative ideas into programmes. The director general said he wanted the BBC to be "the most creative organisation in the world, delivering content that our audiences will simply love". 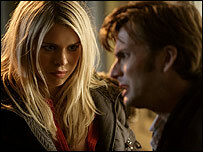 He said the World Cup, Doctor Who and the Proms were examples of how the BBC was already in "great shape on the air". The expanded new media division, to be called Future Media and Technology, will be created and led by current director Ashley Highfield. It will concentrate on finding new ways of delivering programmes to audiences, and improving the BBC's websites and search facilities. However, it will lose the responsibility for creating websites for BBC programmes, as funding for these will now go directly to programme producers. 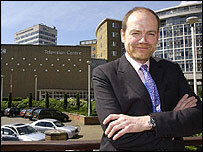 Mr Thompson stressed that audiences should inform the BBC's "thinking, and our choices and our output". To enable this, the Marketing, Communications and Audiences department will act as an advocate for audiences within the BBC. In other changes, the corporation's director of public policy, Caroline Thomson, becomes the BBC's chief operating officer. Sport and News will combine in a new division called Journalism, with current director of sport Roger Mosey to take a place on the BBC's journalism board. An Audio and Music department will take charge of the BBC's audio output, from radio programmes to podcasts. It will also champion music across all BBC platforms. Mr Thompson said the aim of the changes was to make the BBC more creative and efficient "with the licence fee flowing down simple, direct lines to the right people". The director general also told staff that the BBC had made a "new and final" pay and pensions offer to unions on Wednesday. Last week, unions called off a ballot of some 10,000 BBC employees which could have led to strike action over the BBC's pay and pension plans.